The recent outbreak of the ebola virus has turned national attention on this deadly disease. Named after the Ebola River in Africa, Ebola hemorrhagic fever (Ebola HF) affects humans and primates and has emerged sporadically since its first appearance in 1976. The virus appears to be native to the African continent (it has appeared in the Democratic Republic of Congo, Gabon, Sudan, the Ivory Coast, and Uganda). Its natural host is not known nor is its mechanism for survival in nature. Since the natural reservoir of the virus is not known, the way the virus is transmitted to the first patient is not known. However, once one person is infected, the virus can be transmitted in several ways. One way is through direct contact with the blood and/or secretions of an infected person. Thus, family members and friends are prone to get infected. Another route for the virus transmission is within the healthcare facility. Healthcare workers (doctors, nurses) can become infected when they are in contact with needles used on patients. If appropriate protective measures are not taken (use of mask, gowns, etc. ), healthcare personnel can be easily infected. The disease can also be passed from primates to humans. The Ebola virus infection is systemic, meaning that it attacks every organ and tissue of the human body except the bones and skeletal muscles. Ebola HF is marked by blood clotting and hemorrhaging. Although it is not known exactly how the virus particles attack cells, it is postulated that one factor that allows them to do so is that they release proteins that dampen down the immune system response. The Ebola virus attacks connective tissue multiplying rapidly in collagen. Collagen is the tissue that helps to keep the organs in place. The tissue is basically digested by this virus. The virus causes small blood clots to form in the bloodstream of the patient; the blood thickens and the blood flow slows down. Blood clots get stuck into blood vessels forming red spots on the patient skin. These grow in size as the disease progress. Also, blood clots does not allow a proper blood supply to many organs such as the liver, brain, lungs, kidneys, intestines, breast tissue, testicles, etc. Spontaneous bleeding then occurs from body orifices and gaps in the skin, such as needle puncture marks and rips that can suddenly appear. Death is caused by huge loss of blood, renal failure, or shock. 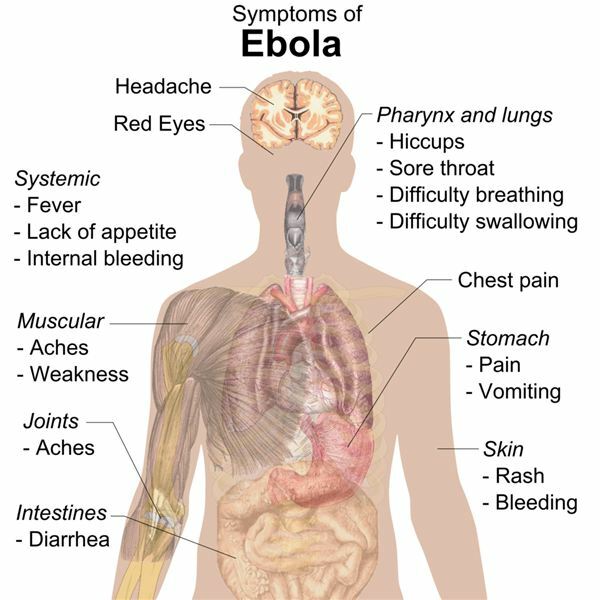 What Are the Symptoms of Virus Ebola? The first symptoms of Ebola virus infection are a sudden increase in body temperature, strong headaches, and joint and muscle pain. Diarrhea, vomiting, and stomach pain usually follow with internal and external bleeding in many cases. Bleeding can occur from the eyes, nose, and tongue. Is There a Cure for the Ebola Virus? Unfortunately there is no cure for this disease. Survival is very low. Research is geared towards creating a vaccine. However, at present time there is no available vaccine for this virus. The American citizens most recently affected have been treated with an experimental new drug, and have been shown to be recovering. This gives us hope for a definitive cure in the future. Peters, C J and LeDuc, JW , eds. 1999. Ebola: the virus and the disease. J infect Dis . 179(suppl 1): ix-xvi.